This year I read some fantastic UKYA novels in a wide variety of genres. 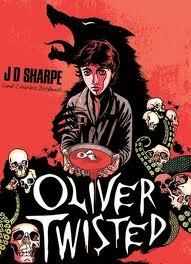 The one that particularly sticks in my mind is JD Sharpe’s Oliver Twisted, from the fantastic Electric Monkey. It’s a great horror/Dickens mash-up, which works really well whether you know the Dickens novel or not. Given the original’s emphasis on hunger, consumption and the body, the transformation of Dickens’ characters into warlocks, cannibals, vampires and zombies really works for me. Categories: Books of the Year 2012 | Tags: J D Sharpe | Permalink. “Flesh,” the woe-begotten moaned at Oliver, baring teeth which were ragged and black. “Flesh” came another moan, and he turned to see two more behind. They began to shuffle towards him, barefoot. The world according to Oliver Twisted is simple. Vampyres feed on the defenceless, orphans are sacrificed to hungry gods and if a woe-begotten catches your scent it will hunt you forever. On the advice of a corpse, Oliver flees his ghastly orphan life to seek his destiny in the dark streets of old London Town, despite the perils of the woe-begotten zombie-infested journey. There he meets the shadowy Dodger, the evil old soul-stealer Fagin, and the menacing Bill Sikes, who is more beast than man. But will Oliver Twisted be the world’s salvation, or its downfall?! Categories: England, Horror, London, Thriller | Tags: J D Sharpe | Permalink.